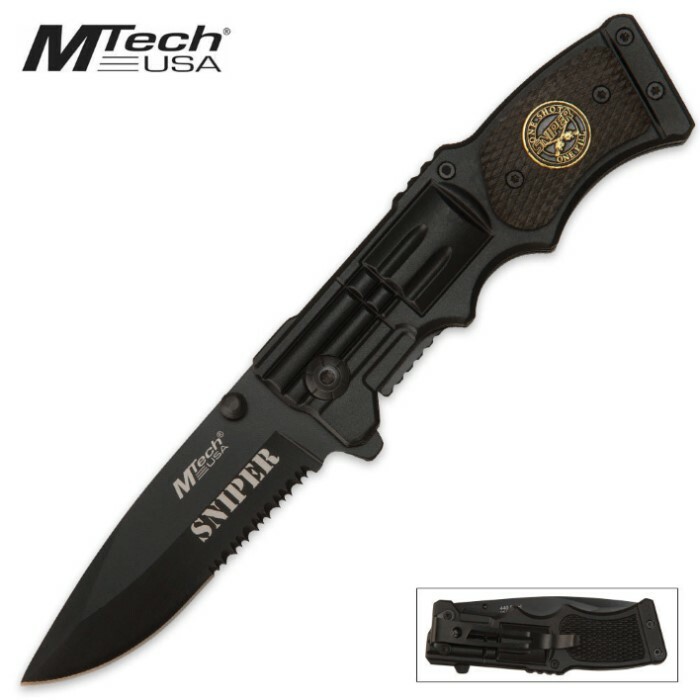 M-Tech Sniper Revolver Pocket Knife | BUDK.com - Knives & Swords At The Lowest Prices! This M-Tech Sniper Revolver folding knife is the perfect tactical folder for your shooting bag. Each knife features a 31/4” razor-sharp, partially serrated 440 stainless steel blade and a grippy handle in the shape of a revolver. Inlcudes an aluminum pocket clip to keep this bad boy close at hand. 4 1/2” cl. I ordered this knife and 6 days later it came, out of the box I was pretty happy. The finish comes off pretty easily, and the pocket clip is loose. It took a couple of days to break in the assisted open but it works perfect now. Fast shipping, good quality for the price. Don't let this stop you from buying it, I'm actually buying my brother the ranger one today. SO I had this deal for shipping for a penny. So I looked at this knife, because this is a really cool knife. Anyway, I ordered it and when it came it was really heavy. Shipping didn't take too long. I opened the case and pulled out the knife. This knife was super sharp. I LOVE THIS KNIFE. Thanks BUDK.